There are moments where everything changed in your life. Celebrate that occasion with the Established necklace. The letter charm can represent your last name or add more to represent each member of the family. The price includes chain, Established charm and one letter charm. If you want to add more letters the price will go up. * The letter C has been discontinued. What is an established necklace? The Established Necklace is a simple way to remind you of when you said yes to the rest of your life. 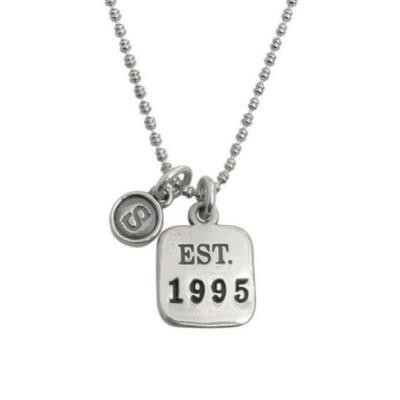 Hanging from the sterling silver chain are two charms - a small initial charm representing your last name and the Est. charm where we will stamp the year you were engaged, married, committed or when your new life began. You can also add initial charms for each member of the family. Dimensions: Tag charm is approx. 1" x 1/4". Est. charm is approx. 1/2" x 1/2". All silver is sterling.